Corn Lilies aka False Hellebore (Veratrum viride) are one of those plants that seem to collect raindrops on their leaves quite readily. 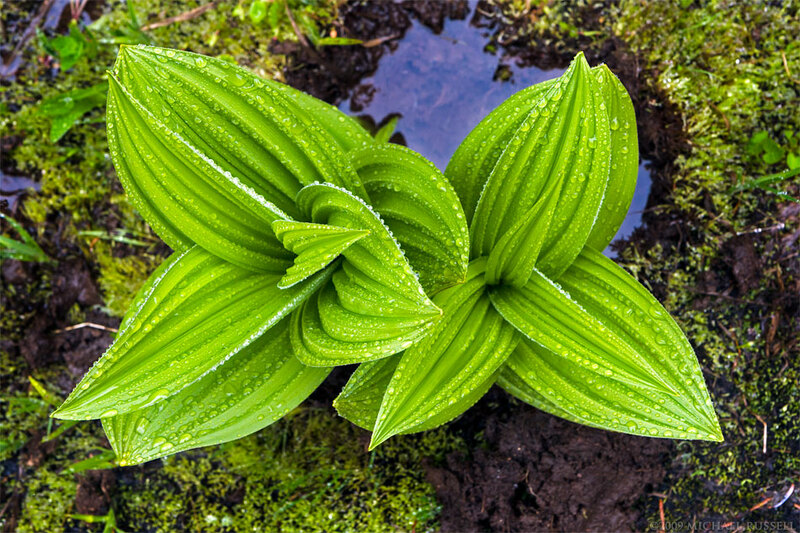 I found this rather young Corn Lily plant at Paradise Valley in Mount Rainier National Park in the spring of 2009 which was well covered in water drops. Many photographers enjoy working with the Corn Lily as it also has some great patterns and textures to work with. I have also found Corn Lily plants at Mount Seymour here in British Columbia, but due to a dry summer I had to blow the dust off that one in order to photograph it! 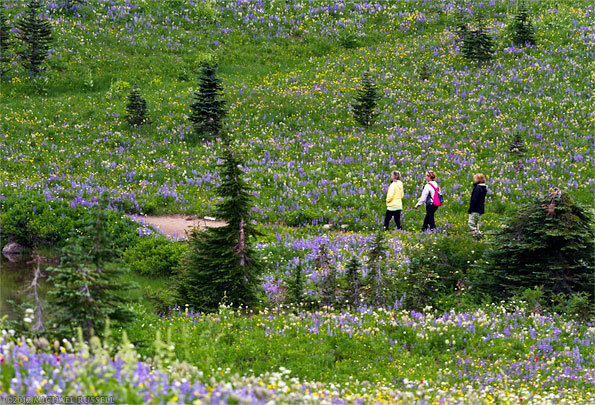 For more photographs from Paradise Valley visit my Mount Rainier National Park Gallery. I have been catching up on editing some older images I made in 2010 at Mount Rainier National Park. Below are two images of historic buildings in the Longmire Historic District. Unfortunately, I don’t think I’ve been to Longmire since I made these photos back in 2010. I tend to enter the park from the Stevens Canyon entrance now due to its proximity to Tipsoo Lake, Sunrise and relatively quick access to the Paradise area. Sadly, Longmire gets left out most of the time now. 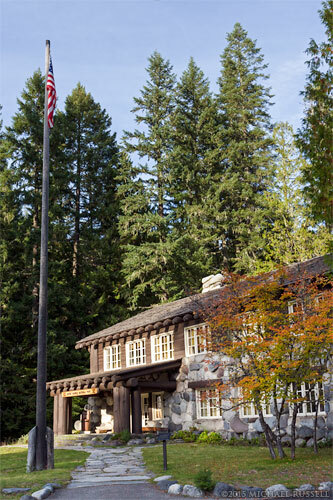 This is the entrance to the historic Longmire Administration Building built in 1928. 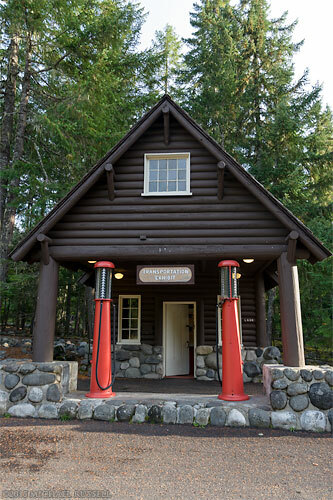 This is the Longmire Service Station which was built in 1927. Between Longmire and Paradise lies a small loop road at Ricksecker Point. 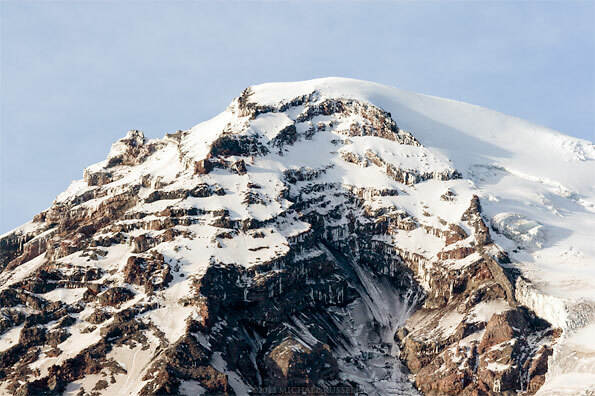 I have photographed many of the views from Ricksecker Point including this telephoto image of the peak of Mount Rainier itself. The glacier on the right hand side of this photo is the Kautz Glacier, which in part forms Kautz Creek many will be familiar with crossing if entering the park from the Nisqually entrance. 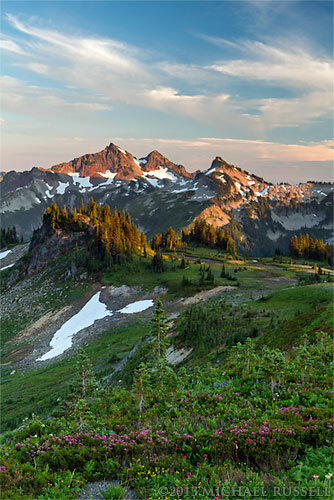 You can find over 200 photographs from Mount Rainier in my Mount Rainier National Park Gallery. On the last day of my 2010 trip to Mount Rainier National Park I got up early and attempted to photograph sunrise at Tipsoo Lake. In what became a learning experience I did not confirm the hotel alarm clock was set to the right time. Consequently I got out of bed too late despite setting the right alarm time which made me miss sunrise. Well, if only I had – I was forced to watch the entire sky turn orange from my car before I had reached the lake. Despite this, I did enjoy walking around the lake, alone, in below freezing temperatures with frost on the now dying wildflower plants. I didn’t really appreciate how peaceful this was until I visited Tipsoo a few years later in the Summer during the peak of the wildflower season. This photograph was made from the viewpoint along SR 410 above Tipsoo Lake. On the right is the edge of Yakima Peak, the Cowlitz Chimneys, Barrier Peak and Governors Ridge can be seen in the center. 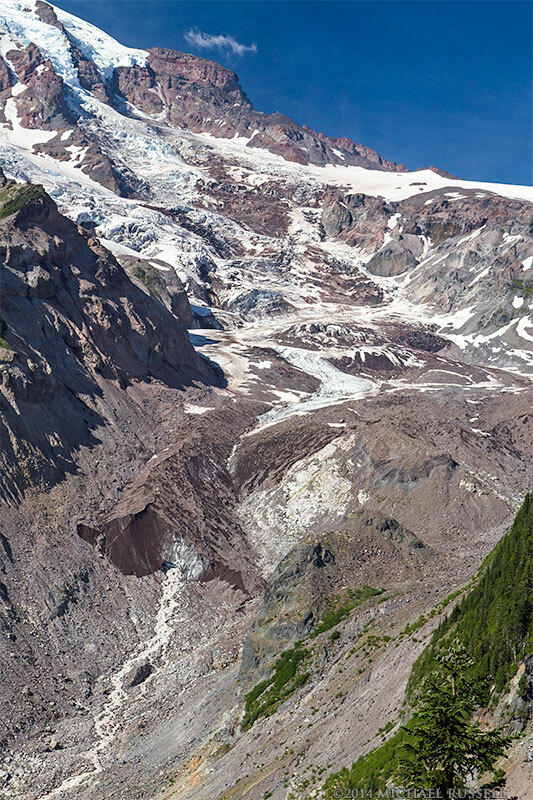 The Cowlitz Chimneys and Sarvant Glaciers at Mount Rainier National Park in Washington State, USA. I have most often viewed the Cowlitz Chimneys in Mount Rainier National Park from the eastern side of the park near Tipsoo Lake. I photographed this panorama of the Chimneys from the Sunrise area of the park along the Silver Forest Trail. The Cowlitz Chimneys are the remains of a rhyolite plug at Mount Rainier and the highest Chimney (South Chimney) has an elevation of 2318m (7605 ft). I had thought when I made this photograph that the patches of snow and ice below the chimneys were just that – the remaining snowfall from the previous winter. However, upon some research it seems that these are the Sarvant Glaciers and are “permanent”. From comparison photographs it seems these glaciers may have melted beyond their usual ebb and flow in recent years due to lower snowfall levels in the winter and warmer temperatures. 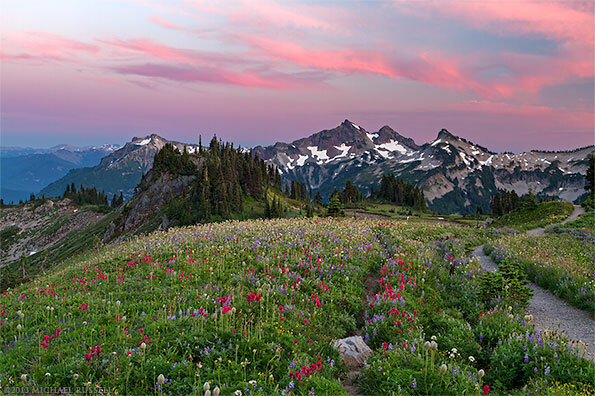 You can see more photographs from this area in my Mount Rainier National Park Gallery. Hiking in the wildflowers around Tipsoo Lake in Mount Rainier National Park, Washington State, USA. Due to the very dry, hot spring/summer which has come after a winter with a lower than normal snowpack, I hear the wildflowers are nearing (or at) peak now at Mount Rainier (July 1, 2015). 2012 was the first time I visited Mount Rainier National Park during the height of the wildflowers in the Paradise and Tipsoo Lake areas. 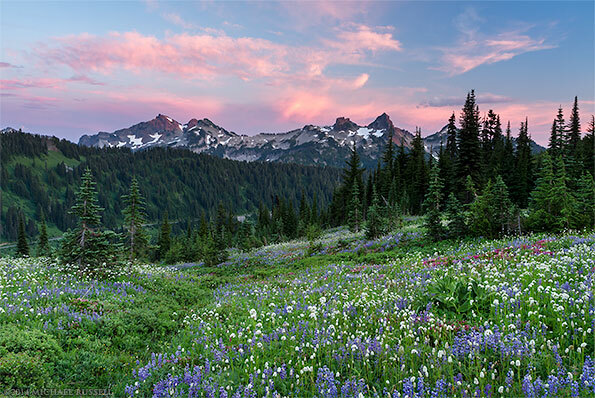 I had been to Rainier a few times at that point, but once you see fields of wildflowers this dense it becomes harder to visit any other time of year. I made this image of 3 hikers near Tipsoo Lake on a foggy afternoon which made for perfect conditions to photograph this location. For more wildflower photographs from this and other visits to the park please take a look at my Mount Rainier National Park Gallery. 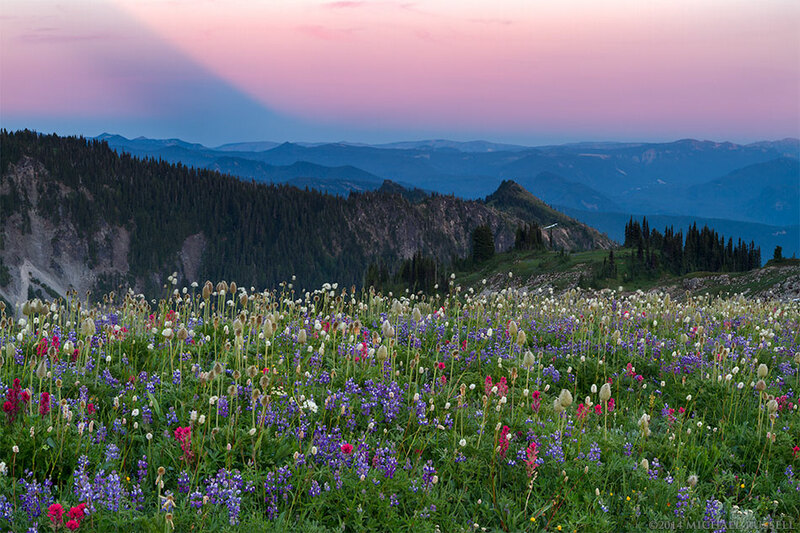 Wildflowers and the Tatoosh Range from Mazama Ridge in Mount Rainier National Park, Washington State, USA. A slightly different version of some previous photographs of the Tatoosh Range from Mazama Ridge in Washington State’s Mount Rainier National Park. I had a great evening hiking from the Paradise area, and this sunset was a big part of that. This area remains one of my favourite places in the park, and the near constant view of the Tatoosh Range is one big reason why. Wildflowers also help. Next time I will hike from the Paradise Inn, not from the bottom of Paradise Valley, however. Not a forgiving trail in the dark! 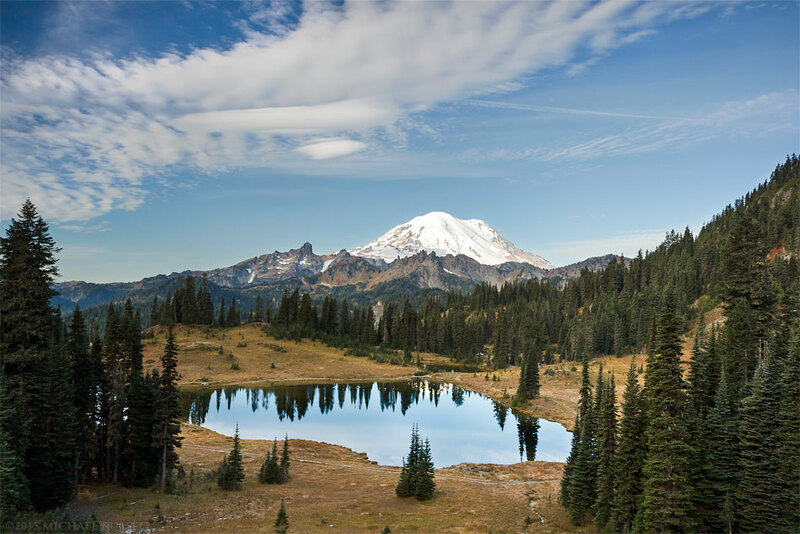 You can view more of my photography from this and surrounding Mount Rainier areas in my Mount Rainier National Park Gallery. Sunset over the Cascade Range from the Skyline Trail on Mazama Ridge. 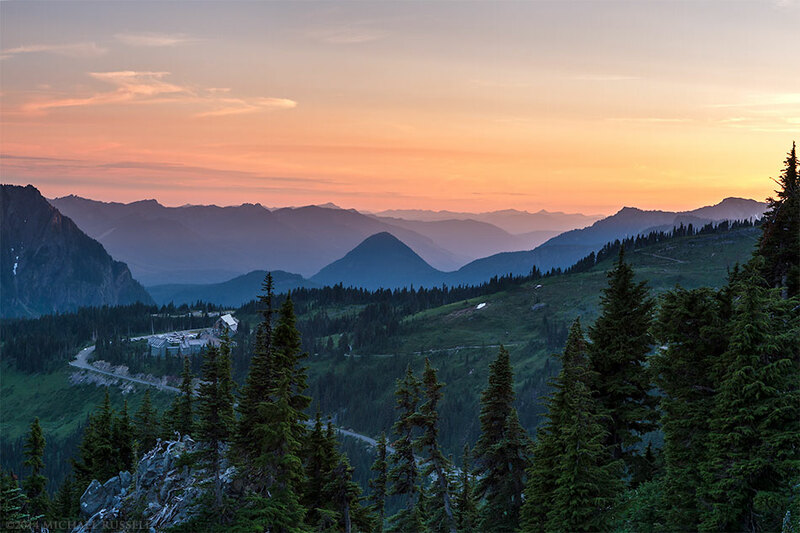 The Paradise Inn, Henry M. Jackson Visitor Center and Paradise Valley Road are in the foreground – Mount Rainier National Park, Washington State, USA. On the first day of my trip to Mount Rainier National Park last year I hiked up to Mazama Ridge. I’d seen a number of photographs from there before, and it looked like a good place to start exploring the area around Paradise – beyond the views available from the roadside. 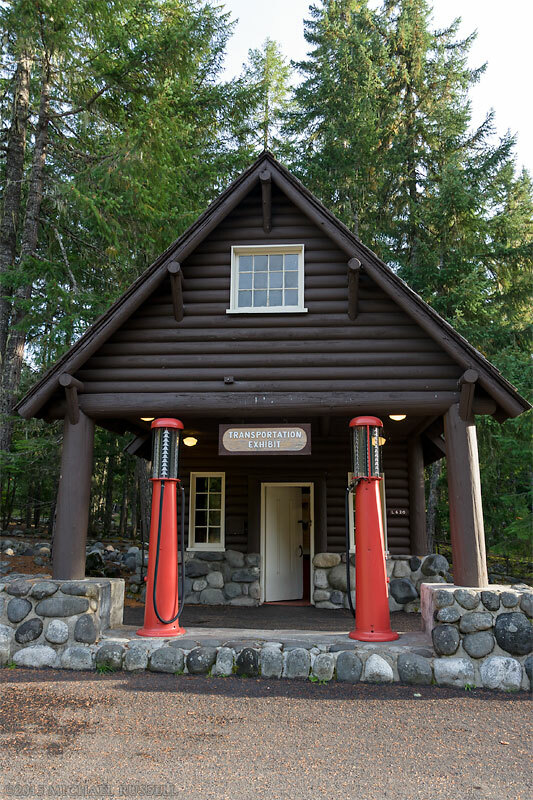 I parked at the small lot (elevation: 5250 feet or 1600 meters) near the Paradise River bridge in Paradise Valley, and hiked up the Fourth Crossing Trail. I’ve been part way up this trail in the past, and though parts of it feel a lot like climbing stairs much of this is right next to the Paradise River which makes it a bit more pleasant. The Fourth Crossing Trail eventually meets up with the Skyline Trail after a climb of around 250 feet (76 m) in elevation. If I had to do this again I would park near the Paradise Inn and walk the Skyline trail from there rather than heading back down to my car along the Fourth Crossing Trail in the dark. From the junction of the Skyline and Fourth Crossing trails there is a series of switchbacks to get you up to Mazama Ridge (at an elevation of around 5800 feet (1770m)). The Skyline Trail then comes to a junction with the Lakes Trail (which Google refers to as the Mazama Ridge Trail). As I was still primarily scouting I headed down the Lakes Trail in search of wildflowers and places to photograph. This trail heads downhill gently at first, but if you wish it will take you all the way down to Reflection Lakes. The panorama below is a view of the Tatoosh Range before the trail gets down into the trees. After making a few photographs along the Lakes Trail I headed back up to the junction with the Skyline Trail. I scouted the Skyline Trail up past the Stevens Van Trump Historic Monument at which point the light turned the sky a nice colour and the shadows disappeared from the foreground. At this elevation the Tatoosh Range comes into a better view compared to lower down on the Lakes Trail. I’ve said this before but often I prefer photographing the Tatoosh Range over Rainier itself – especially when in the Paradise area. 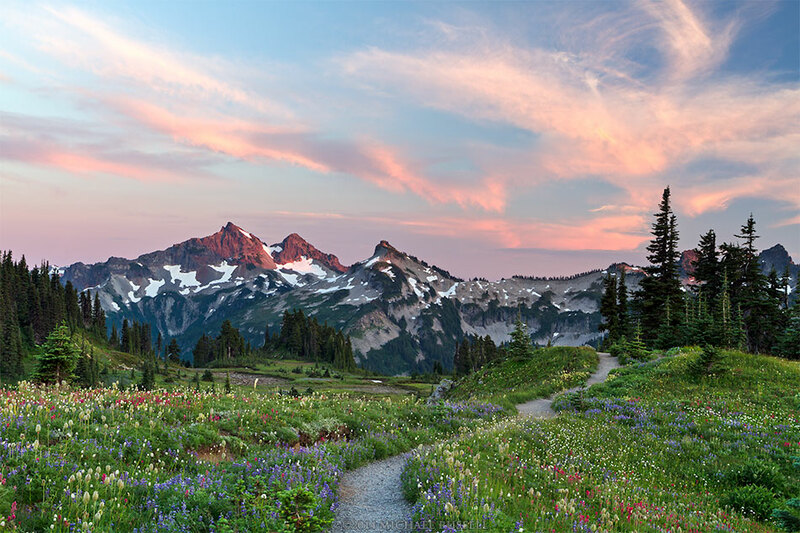 I wrote a bit more about this in an earlier post featuring a panorama of the tatoosh range. Rainier takes up a lot of the sky and can be tough to photograph backlit by the sunset in the evenings. Dawn would probably be an ideal time, but I’m saving that for when I actually stay at the Paradise Inn or relatively nearby. I had seen a few photographs with the shadows of mountains at sunrise and sunset, but hadn’t give it much thought in terms of finding this phenomenon myself. It was on Mazama Ridge I saw this for the first time. The dark blue in the sky is the shadow of Mount Rainier cast down towards Stevens Valley and the Cascade mountains to the east. I’ve shown the following image before, but I think it remains my favourite of all the images I made that evening on Mazama Ridge. A lot of Magenta Paintbrush (Castilleja parviflora) in the foreground (as opposed to the usually dominant Lupines) and great sunset colours in the sky. This was near the intersection of the Skyline Trail and the Paradise Glacier Trail. Rainier Wildflowers and the Tatoosh Range from Mazama Ridge. You may also be interested in my report from the area north of the Paradise Inn – The Skyline Trail and the Golden Gate Trail and the Mount Rainier National Park gallery in my image archive. I recently caught up on a bit of my photo editing backlog and have now added just over 50 new photographs to my Mount Rainier National Park Gallery in my image library. I have published a few of those images in previous blog posts, but I thought I would share a few more from the Paradise area of Mount Rainier National Park here. 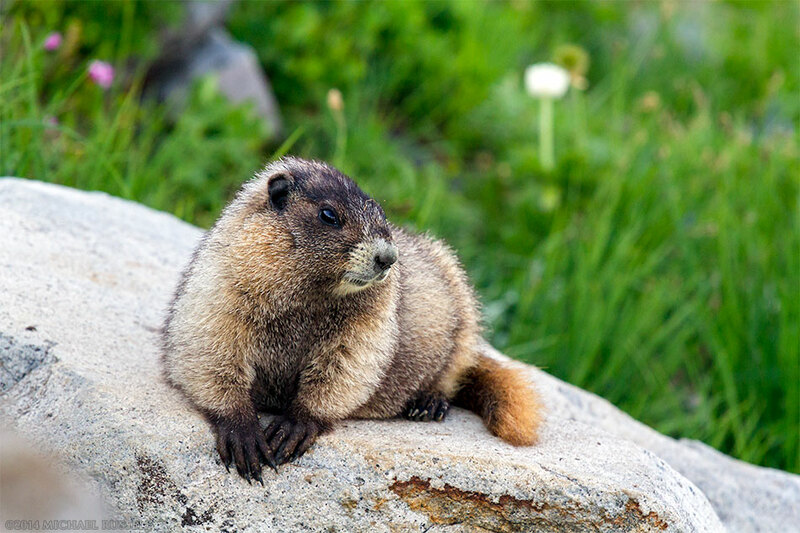 It’s not easy being a Marmot! While I was relaxing on a rock waiting for better light along the Golden Gate Trail in Mount Rainier National Park, I saw this Hoary Marmot (Marmota caligata) doing the same. Well, it probably wasn’t waiting for better light, but relaxing after a hard afternoon munching on lupine foliage and gathering nesting material. It clearly knew I was there, but didn’t seem to care at all. Probably was used to people along a relatively busy trail in the Paradise area of Mount Rainier. 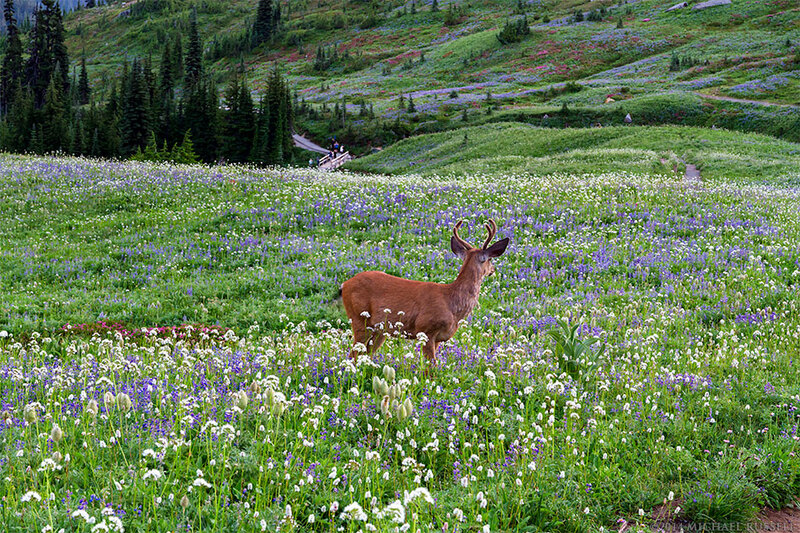 You can spot the deer, you can get in position to photograph them as they move through the wildflower field, but you can’t make them look at you! A pair of Black-tailed Deer (Odocileus hemionus columbianus) were nice enough to amble right past me in the wildflower fields on the Golden Gate Trail above Paradise, but never once glanced in my direction. I even scuffed my feet in the gravel trail once… nothing. At least I know I wasn’t disturbing them. There is something I always enjoy about the combination of lush wildflowers (in this case mostly Broadleaf Lupines and some Pink Mountain Heather) and a waterfall. The mosquitoes thought so too! I have always found this angle of view on the Nisqually Glacier to be interesting from Ricksecker Point and other areas near Paradise. This time I photographed it from the Nisqually Vista Trail for an even better view. In this photograph you can see the icefall of the glacier and the terminus at the bottom, as well as the very beginnings of the Nisqually River from the melting ice. 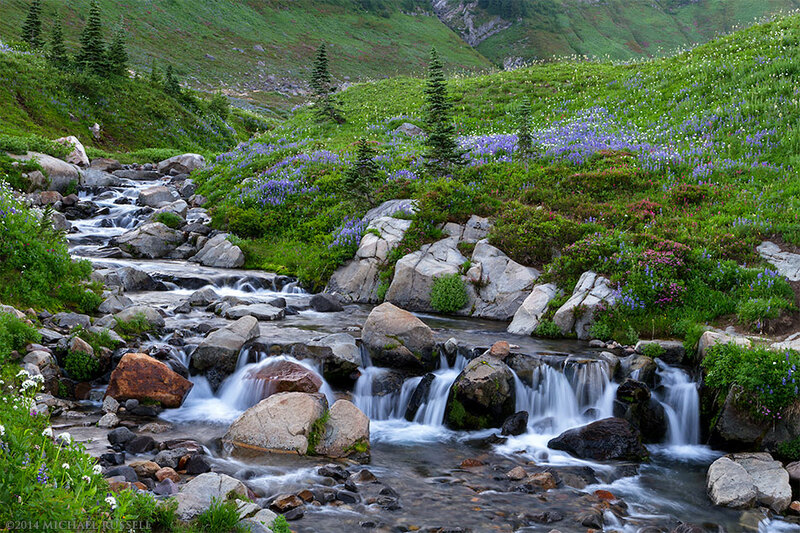 You can see even more photographs from the Paradise area in my Mount Rainier National Park Gallery.